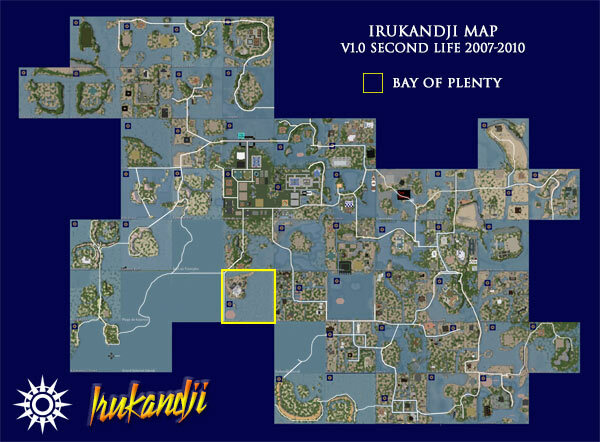 Bay of Plenty is a simulator on the Second Life virtual world. It is part of Tamita State in Central Irukandji. Up until I created the the Kalamat nation, Bay of Plenty was the westernmost region and marked the edge of the kingdom. Bay of Plenty took its name from the region in New Zealand of the same name. I did this in large part to acknowledge the support of of Kiwi residents on the estate. During its two year life on the grid, Bay of Plenty enjoyed 100% occupancy, with a single landholder leasing a large atoll in the southwestern corner of the bay. A long underwater section of the Trans Irukandji Causeway traversed the sim from north to south, which is visible in the adjacent photo. Clockwise from northwest, sims that adjoined Bay of Plenty were Baie de Triomphe, Crystal Atolls, Baie de Citron, Alantay Island, and Irukandji Sound. Bay of Plenty lost its principal landholder in 2009 due to the GFC and was subsequently taken offline.